9 demands: A living wage for work, educational opportunities, decent health care, an end to cruel and unusual punishment, decent living conditions, nutritional meals, vocational and self-improvement opportunities, access to families, and just parole decisions. After months of organizing (primarily using contraband cell phones purchased from prison guards), thousands of Georgia prisoners launched a strike on 9 December 2010 when prisoners assigned to the earliest breakfast shift refused to leave their cells. This was the first major multi-racial prison strike and largest prison strike in American history. The target was the Georgia State Department of Corrections. The strike was announced as a one-day action. The following day, the press release reported that thousands of men participated from Augusta, Baldwin, Hancock, Hays, Macon, Smith, and Telfair State Prisons. Prior to the strike, there is little information about the organizing initiative. The action was decentralized and there are no known leaders. Elaine Brown, former president of the Black Panthers and co-founder of the Georgia chapter of Mothers Advocating Juvenile Justice, became a spokesperson and media contact on behalf of the incarcerated strikers. She also formed the Concerned Coalition to Respect Prisoners’ Rights for people looking to express solidarity with the campaigners outside of the prison. Early on, the Georgia Green Party expressed support and solidarity with the strikers-- the organization was run by the same person who ran the Black Agenda Report, one of the leading media outlets related to the strike. The campaigners issued the following nine demands: A living wage for work, educational opportunities, decent health care, an end to cruel and unusual punishment, decent living conditions, nutritional meals, vocational and self-improvement opportunities, access to families, and just parole decisions. Many of these demands look to the 13th Amendment to the American constitution, which prohibits slavery and involuntary servitude and the 9th amendment, which prohibits cruel and unusual punishments. A fact finding commission reported that there were no educational opportunities for incarcerated people in Georgia past the GED high-school equivalency exam besides a Baptist ministry training program with about 20 inmates involved. Also, Georgia prisons were so crowded that they added a third tier to bunk beds in rooms that were intended for one person at a time. The resounding quote, following the demands, was “No more slavery. Injustice in one place is injustice to all. Inform your family to support our cause. Lock down for liberty!” In all press releases, Elaine Brown emphasized the strikers’ commitment to nonviolence. By 13 December, the Georgia Department of Corrections reported that the four prisons with complete strikes (Hays State Prison in Northwest Georgia, Macon State Prison, Telfair State Prison, and Smith State Prison in the southern black belt) were in lock-down, and no prisoners were permitted to leave their cells. Prison officials responded to the strike by turning off hot water, transferring prisoners suspected to be strike leaders, searching rooms and confiscating cell phones. Some reports also say guards turned off heat in the building. Some responses were more violent. Over the course of the 6-day strike, there were reports of pepper stray and tear gas, guards forcibly grabbing campaigners from their cells, and guards patrolling with assault weapons. At Macon and Hays State Prisons, in particular, tactical squads arrived to provide additional security and treated inmates with physical violence. More than one campaigner was hospitalized, and one in particular went into a coma as a result of these beatings. These beatings continued well beyond the strike, as officials looked to punish suspected leaders. After 6 days, on 15 December, the campaigners called off the strike because they wanted the authorities to devote their attention to the demands instead of organizing prison lock-downs and violence. By December 2012, the Department of Corrections had not yet met the demands. In the aftermath of the strike, a prison guard was incarcerated for his violence and other guards and prison staff received penalties. The NAACP (National Association for the Advancement of Colored People) continued to apply pressure to the Department of Corrections and Department of Justice, as Georgia has an incarceration rate 16% higher than the national average, although the cost per prisoner is 39% the national average. Prison reform advocates speculate that this discrepancy is due to unpaid prison labor. Although the strikers did not win their demands or receive much mainstream media attention, they achieved unprecedented levels of internal organization and solidarity. (2) This strike influenced a 2012 hunger strike for 5 weeks demanding that the prison staff review solitary confinement status every 30 days as per Georgia law, a restoration of family visiting privileges and access to legal and medical services. Chen, Michelle. "Georgia Prison Strike: A Hidden Labor Force Resists." In These Times. N.p., 17 Dec. 2010. Web. 25 Nov. 2012. .
Dixon, Bruce. "GA Prisoner Strike Continues a Second Day, Corporate Media Mostly Ignores Them, Corrections Officials Decline Comment." Black Agenda Report. N.p., 10 Dec. 2010. Web. 25 Nov. 2012. .
Goodman, Amy. "Prisoner Advocate Elaine Brown on Georgia Prison Strike: "Repression Breeds Resistance"" Democracy Now! N.p., 14 Dec. 2010. Web. 25 Nov. 2012. .
Li, Kung. 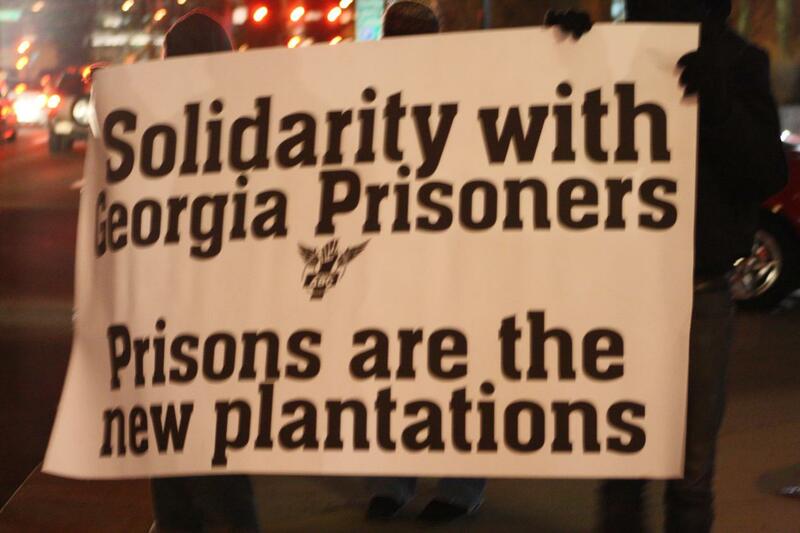 "Georgia Prisoner Strike Comes out of Lockdown." The Institute for Southern Studies. N.p., 16 Dec. 2010. Web. 25 Nov. 2012. .
"NAACP Wants Justice Dept. to Intervene in GA Prisoner Hunger Strike." EURweb. N.p., 15 Dec. 2010. Web. 25 Nov. 2012. .
Olson, Ole Ole. "The Largest Prison Strike In US History Rages On | NEWS JUNKIE POST." The Largest Prison Strike In US History Rages On | NEWS JUNKIE POST. N.p., 16 Dec. 2010. Web. 25 Nov. 2012. .
Sloan, Bob. "Slave Labor - A Calm Revolt in Georgia Brings This Issue to the National Spotlight." Daily Kos. N.p., 18 Jan. 2011. Web. 25 Nov. 2012. .
Wheaton, Sarah. "Prisoners Strike in Georgia." NY Times. N.p., 12 Dec. 2010. Web. 25 Nov. 2012. .